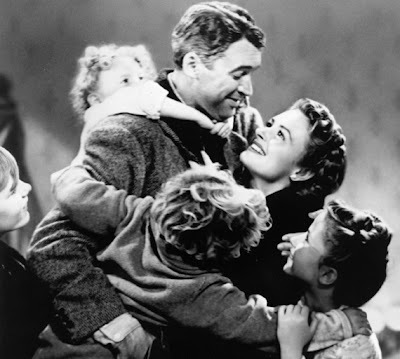 The girls and I watched Frank Capra's "It's A Wonderful Life" last night as part of our 101 Things in 202 Thursdays quest (it's #41 on Rotten Tomatoes' 100 Best Kid and Family Movies). Alex and Sage remained interested throughout and neither seemed to care that the film was in black and white. 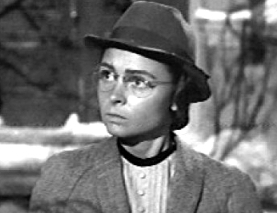 Both marveled at the "old-time" telephone, the phonograph...and the fact that ending up an "old maid" librarian was the worst fate Capra could imagine for alternate-Mary. Boy George (George as a boy...not the 80's pop phenomenon) returns to the pharmacy after not delivering the poisonous pills...the pharmacist smacks George upside the head multiple times, causing George's left ear to heavily bleed. Neither of my daughters liked this scene. They were especially sensitive to George's pleads and cries of pain. Alex didn't like it for one additional reason -- believability. She said there was no way an ear would bleed like that after being hit in that fashion. Older George and Mary dance while the gymnasium floor opens underneath them, revealing the swimming pool below. My kids thought this was so funny! They giggled throughout the entire scene. Mary's robe comes off outside; she hides in a bush while George charmingly teases her. Alex thought this was amusing while Sage frowned and declared, "He's not being very nice." The final scene. Everyone is coming in through the door while George stands there holding Zuzu. Initially, there's blood on George's face, a leftover from the scene at the bar. Sage: "He needs to wipe the blood off his face!" The blood mysteriously disappears during this scene...Alex realizes this and exclaims, "Hey -- where's the blood?" We had a good time with this movie. The main messages hit home and both girls gave it a thumbs-up.